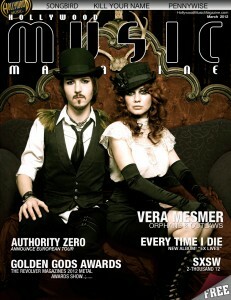 (By Nadia Guardado) Engaging audiences all over, Vera Mesmer might not be a name that you have heart yet. However, I guarantee you will fall in love with what Christopher Mesmer and Nadja Peulen have created. Theatrical and direct, their music is something that cannot be compared to anything of it’s kind. Just like with every interesting band you encounter, you want to know more about them, as people as a band in whole. You want to know what inspires them, how they work, how what they do is well, done. Here is a glimpse into what makes Vera Mesmer such an awesome band. HMTV: How did the idea to form Vera Mesmer come about? HMTV: How is the chemistry between you two? Musically and Personally. Nadja: Musically/ creatively we work in total balance and harmony. We tend to have our own areas of duty within the band and jump onto each other’s plate half way through to help the other. It gives us a sense of love and attachment for the project as a whole and makes the most efficient process possible! Kind of like this interview, I start it and Chris will finish it haha. It’s still amazing to me how easy it flows and how we are always on the same page and have the same ideas, practically finish each other’s sentences at times. Personally we throw knives at each other, hit each other over the head with giant plastic keys and then drink a bottle of wine and laugh at it. We’re artists, we’re nuts it makes good songwriting material and performances. HMTV: What is your material about? HMTV: Nadja, you’re mostly known for having been in Coal Chamber and the success that was. Is that fact a pro or con when it comes to forming another band such as Vera Mesmer and why people become interested in the project. Nadja: You know, the CC thing hasn’t even really been mentioned much. I’ll always think fondly of that part of my life but VM is very special to me and the two are just worlds apart so it’s almost a non-issue. HMTV: Christopher, Vera Mesmer is being well received by its fans and your friends, why do you think that is? HMTV: “Back From The Dead” is a very detailed video with an interesting story being told in it. What was the inspiration behind the song and video treatment? HMTV: Can you describe your live show to a person who has never seen it live before? HMTV: What can Vera Mesmer fans expect to see and hear this year?